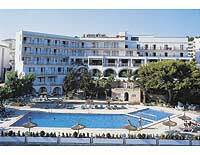 The Hotel Casablanca is in a beautiful setting by the fabulous Santa Ponsa beaches in Mallorca , an excellent position with panoramic views overlooking the sea. Situated in this privileged position, only 200 metres from Santa Ponsa beach, there are two championship golf courses nearby and the Club Nautico Marina. This hotel is great value for money with bright modern dcor and furnishings, good facilities and fabulous pool and sunbathing areas for all the family. Hotel Casablanca is recommended for its friendly atmosphere, local facilities such as boutiques, bars and restaurants, as well as sports centres, tennis, golf courses and nautical sports nearby. Check in here and you can relax in the warmth of the Spanish sunshine. Getting to the hotel: Hotel Casablanca is only 28km from the airport; the transfer from can be made by taxi, bus or private transfer.